It will perhaps come as no surprise to those familiar with human nature and profit that the world's most expensive coffee is produced using extreme cruelty. 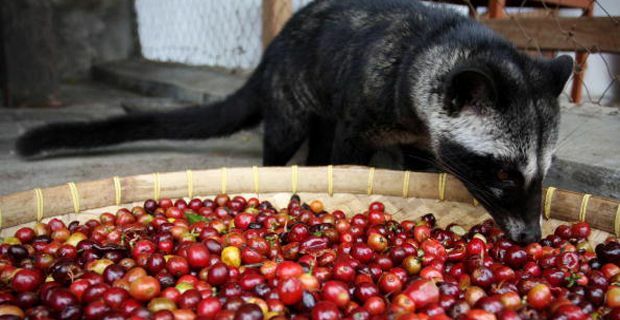 Kopi Luwak coffee is made from the beans of coffee berries that have been eaten and excreted by Asian palm civets. Civet beans sell for over £140 per lb and can cost up to an extraordinary £60 per cup. It is included in Harrods £20,000' The Decadence Hamper, which contains almost every luxury foodstuff imaginable. But an investigation by People for the Ethical Treatment of Animals (Peta) has found that that animals at civet coffee farms in Indonesia and the Philippines are kept in barbaric conditions and can actually be reduced to madness by being locked in tiny cages. Disturbing film footage shows the civets locked in filthy cages, suffering from skin infections and exhibiting bizarre and neurotic behaviour. Despite these conditions, the farms also advertise their beans as being "wild-sourced". A farmer explained that they are caged for around three years but when they are released, they rarely survive. Mimi Bekhechi, Peta's UK associate director, said: "Drinking coffee made from beans that were plucked from faeces isn't the most unappetising aspect of civet coffee. Confining civet cats for years - as they go mad and lose their fur from the stress - for an expensive cup of Joe would turn the stomach of any compassionate person." Tony Wild, author of 'Coffee: A Dark History', said: "The whole reason everybody regurgitates that story is that by being incredibly rare, you can keep a ridiculously high price". The former coffee trader has now set up a petition to stop Harrods stocking Kopi Luwak coffee (http://www.change.org/petitions/harrods-cut-the-crap-stop-stocking-kopi-luwak). A spokesperson for Harrods said: "Harrods works closely with all its suppliers to ensure the highest standards of ethical sourcing, production and trade are maintained. This is carried out through strict auditing procedures. "Our exclusive supplier ... has given Harrods every assurance the coffee we are provided with is organic, and comes from wild palm civets."